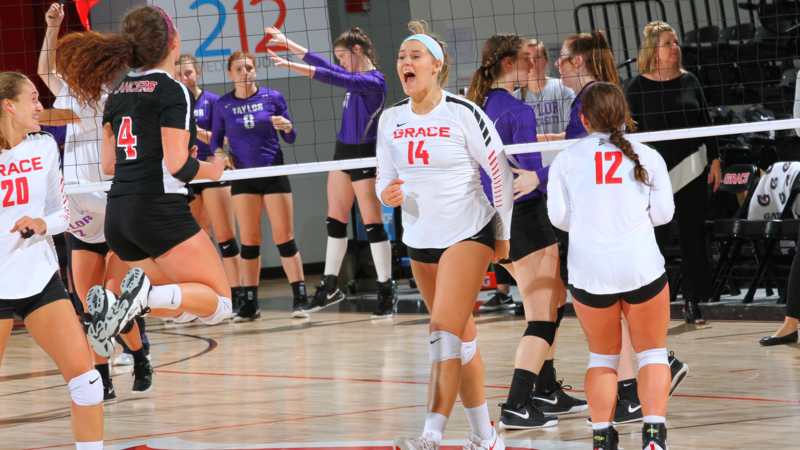 Grace’s volleyball team produced a stunning upset of Southwestern Assemblies of God (SAGU) on Thursday at the NCCAA National Championships. The Lady Lancers split the day, falling 3-1 to the host school College of the Ozarks before upsetting SAGU 3-1. Grace controls its own destiny and can reach the NCCAA semifinals with a win in the last pool play match. The Lady Lancers will play Trinity International on Friday at 1 p.m. to wrap up pool play. In the opening match, Grace missed on its chance to upset the host Ozarks. The Lady Lancers were in prime position to win the first two sets but could only come up with one win. The first set was hotly contested from start to finish. Kelsee Zuidema served up two straight aces midway into the game to help Grace to a 14-13 lead. The set remained close and saw the score tied at 19, 20, 21, 22 and 23. Ozarks went ahead 24-23 to serve for the set, but Zuidema’s kill sent the set to extra points. The Bobcats secured the win, however, at 28-26 with a kill and a block. Grace found revenge in the second set with a 25-20 win. The Lady Lancers had 13 kills on just three errors in the set. But Grace’s offense went dry for the rest of the match. The Lady Lancers committed 18 attack errors in the third and fourth sets, losing 25-14 and 25-16. The Bobcats, on the other hand, had 27 kills and just nine errors during that span. Caylie Teel picked up a double-double with 15 kills, 15 digs and 2 solo blocks, Marta Bleed had 11 kills, and Alexa Hilltallied 39 assists and 14 digs. Gina Novotny led all players with 25 digs, Zuidema notched nine kills with four aces, and Makaela Lochmueller added eight kills. Grace toppled the tournament’s No. 2 seed SAGU in the nightcap. Midway into the opening set, Grace trailed 13-9. But Grace won five of the next six points to tie the game. Grace slowly pulled out in front and held on for a 26-24 victory. In the second set, Grace broke open an 18-17 lead by scoring six straight points. Hill and Bleed had a kill during that stretch, and Emily Sharp aced a serve. The Lady Lancers took a 2-0 lead in the set thanks to a 25-22 win. The Lions countered with a 25-22 victory in the third set to keep pressure on Grace, but Grace handled it well. Grace started the fourth set sharply with a 5-1 edge. The Lady Lancers refused to yield that lead and still were ahead 18-16. Grace then won five of the next six points and cruised to a 25-18 win. Kelsey Smith and Zuidema combined on a block for the final play. Zuidema (14 kills, 10 digs) and Teel (12 kills, 19 digs) had double-doubles for Grace, and Hill added 43 assists, 11 digs and 7 kills.